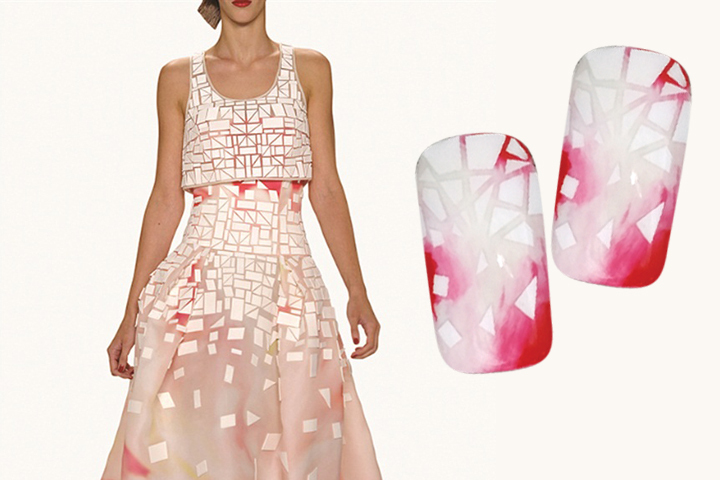 Keep clients looking sharp with cutting-edge nail fashion taken straight from the runway. 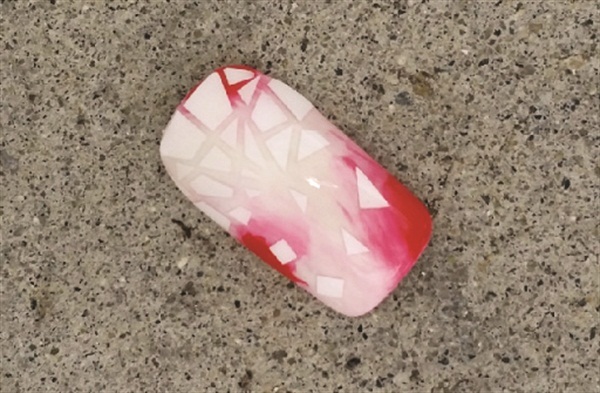 Elizabeth Morris (@thenailhub) of Va-Va Varnish in San Diego was inspired by Carolina Herrera’s Spring 2015 ready-to-wear collection to create this shattered shape nail design. Keep clients looking sharp with cutting-edge nail fashion taken straight from the runway. 1. 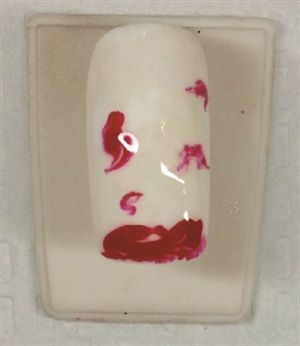 On a fully prepped nail, apply a thin layer of Luxio Base and cure (all curing steps are 30 seconds in an LED lamp or two minutes in a UV lamp). 2. 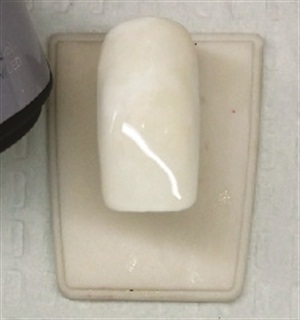 Apply a thin layer of Akzéntz Gel Play White to the entire nail and cure. 3. 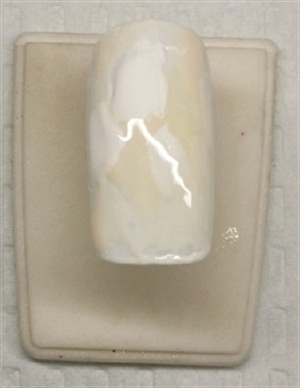 Using small amounts of Creamy Dream, Ivory Silk, and Gel Play White, place gel in a random pattern over the nail surface. Don’t cure just yet. 4. Using a clean gel brush, pat and blend the gel to create a creamy marbled effect. 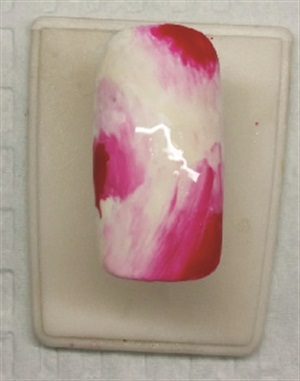 Be careful not to over blend or it will become one cohesive color rather than a marbled effect. Cure. 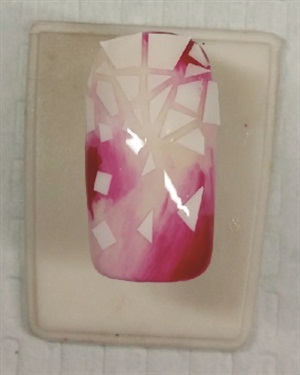 Apply a thin layer of Luxio Gloss to the entire nail. Don’t cure just yet. 5. Apply small dabs of Classic Red to the nail in a random pattern. 6. Using a clean gel brush, very lightly blend the red to create the effect of fading into pink in certain areas. 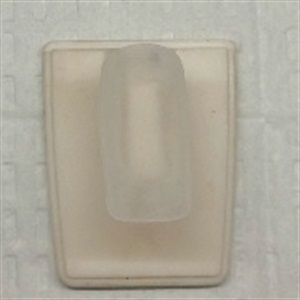 Work in very thin layers to make sure the nail does not become too thick or bumpy. When you feel the red is well blended, cure the nail. 7. On a form, paint a thin layer of Gel Play White and cure. Using a razor blade, carefully cut the gel into geometric shapes. Leave the pattern on the form so that it creates a puzzle for you to follow during placement. 8. Paint another very thin layer of Luxio Gloss on the nail. 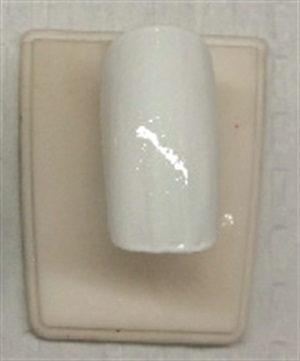 Using tweezers, place the white gel puzzle pieces on the nail and fade from cuticle to free edge. Make sure to place them so they align, but have small spaces in between. Once you are happy with the placement, cure. 9. 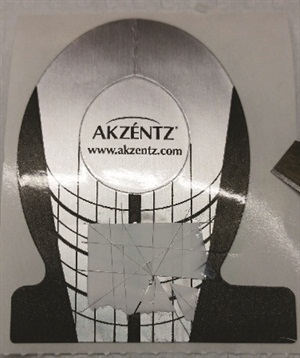 Cap the entire nail in Akzentz Shine-On and cure. Shine-On does not have a tacky layer so there’s no need to cleanse. The slight blue tint really makes the white pop in this design.